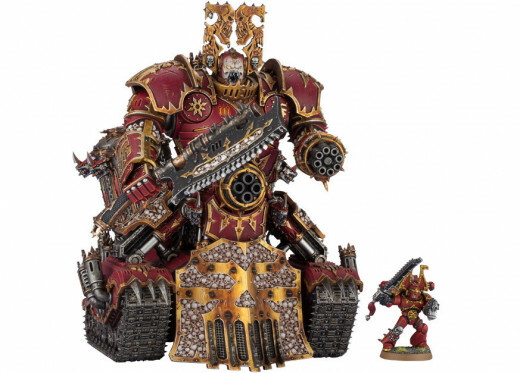 With the release of the new Apocalypse expansion for Warhammer 40k 6th edition, GW has also released a few new models. 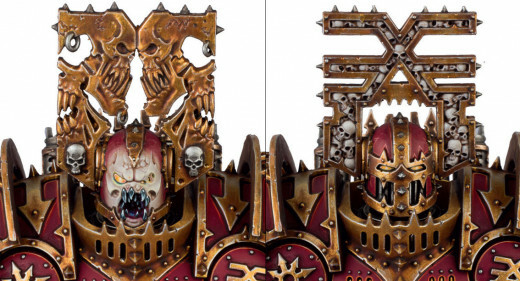 Murphy, here, back to give a review of the awesome new model, the Khorne Lord of Skulls. For updates on new Apocalypse articles, give me a follow on Twitter (@BenMurphy) or follow me here on Hubpages by clicking my profile at the top of this article. 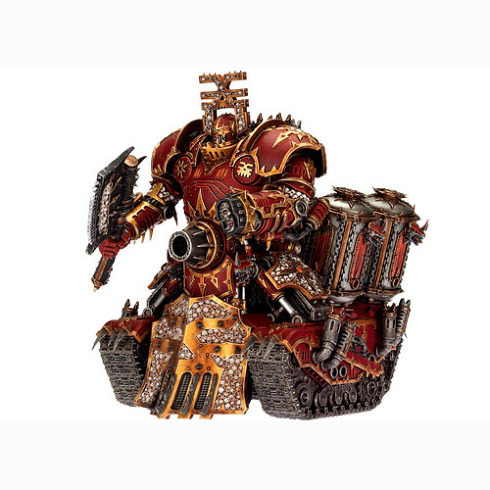 A few people have noted online that they don't like the new Lord of Skulls model, saying it's too bulky, static, or robotic looking. I see their points and I think that a clever hobbiest could do wonders by positioning the arms in a more natural way. 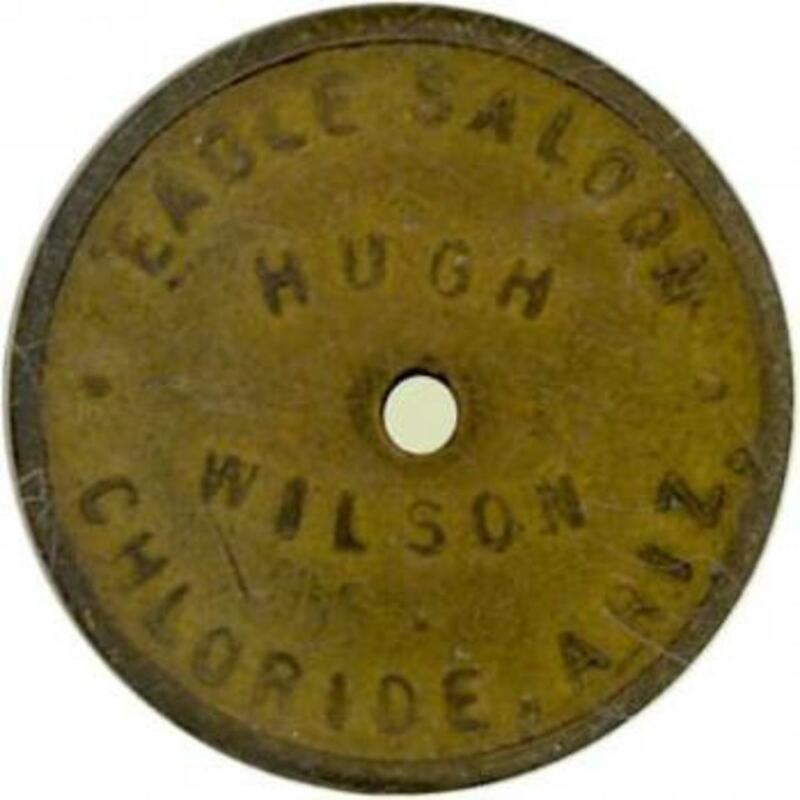 However, the model is chalked full of details, and the rules can't be beat. So let's check it out. 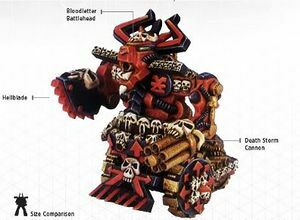 First, let's classify exactly what the Lord of Skulls is. It's a Super-heavy Walker . . . with tank treads. Basically it follows all the rules of super-heavy walkers, but it cannot make a special Stomp Attack. Instead, it is allowed to tank shock or ram using the new Thunderblitz table that super-heavy vehicles can use. It's a pretty awesome table that can inflict wounds on units that you attempt to run over and is much more deadly than what standard vehicles can get. You will notice that it's actually fairly lightly armored, with only a AV 13 at the front. Don't worry, though. This thing also has 9 hull points and, since it is a super-heavy, it is immune from a lot of the damage effects that weaken typical vehicles. This thing will take a licking and keep on ticking . . . especially because it's special rules, which are listed below for your convenience. Daemonforge - just like the CSM daemon vehicles, it can re-roll To Wound or Armor Penetration rolls once per battle, but at the risk of losing a hull point. So far, it's pretty awesome! The Lord of Skulls has two new special rules which I will outline here. What does a Destroyer weapon do? You don't even roll to wound or penetrate armor. One a 2+ non super-heavy vehicles simply suffer an Explodes! result, while super-heavy vehicles take d3+1 or d6+6 hull points of damage. Non-vehicle models on a 2+ take d3+1 wounds or d6+6 wounds. By the way, models suffering a hit from a Destroyer weapon are not allowed to make saving throws of any kind! Wow! Instead of making a Stomp attack like a super-heavy Walker, it can use the Thunderblitz rule to make Tank Shock or Ram attacks like a super-heavy vehicle. This is pretty nasty itself, as you can inflict multiple wounds on a unit or even destroy another vehicle before the unit even has a chance to escape or make a Death or Glory! attack. Don't get in this thing's way! Gorestorm Cannon - using the giant 16.5" flamer (Hellstorm) template - Str 8 AP 3 - Primary Weapon (pick highest of 2 dice for armor penetration). Skullhurler - 60" Str 9 AP 3 - Primary Weapon 1, Apocalyptic (10") Blast, Gnaw (re-roll successful saves verses this weapon). What can I say? This thing is designed to get in close and melt things, and then follow up by butchering said things so that nothing is left but hunks of bloody, oily things. With it's basic load-out, you will be annihilating enemy troops. The Hellstorm template at AP 3 will be boiling anything but terminators, but you have to get close. Until you get there, however, the Hades Gatling Cannon gives you 48" of death that will basically destroy a unit of troops every time. Personally, I would keep this thing out of melee with troop selections unless A) you have more support to join you, or B) it has already lost hull points to gain extra attacks. It's not that this thing is vulnerable to most troops, it's that you don't want to get bogged down killing 50+ points of space marines that aren't going to run away. You DO, however, want to get into charge range with other super-heavy vehicles. With 6 attacks on the charge, hitting typically with 4 of those, you will most likely be taking away 4d3 + 4 hull points in a single turn of combat. Take that, Baneblade! So should you upgrade the Lord of Skull's weapons? It depends. Both of the major upgrades give you Strength 9 weapons, which can make a big difference at penetrating heavy armor. It will also push your points up to just over 1,000. It's up to you. One interesting thing to point out is that every model in Apocalypse games are scoring, which means you can park this bad-boy over a Strategic Objective and make your opponent come and get some. Eggs for the Egg Lord! So there you have it! 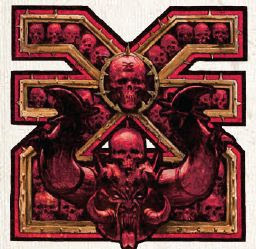 I think the new Khorne Lord of Skulls is a fantastic addition to any Traitor army to bring to an Apocalypse game. Price-wise, it's a lot cheaper than any Titan and, while it doesn't have the Destroyer-level weapons that other super-heavies might have, it does bring the heavy weapons to bear. This will likely eat one or two units of troops per round, or be taking out standard vehicles with some decent rolling. Remember that Primary Weapons can roll two dice for armor penetration and pick the highest, and it has Daemonforge (which allows a re-roll one turn per game), so even with a Strength 8 weapon, it stands a good chance of penetrating most standard vehicles. The nastiest part of this model, though, it when it gets wounded and then makes its way into melee. It will make short work of even Titans in close combat! Alright, this is the end of my first super-heavy review! Why not take the poll to the right and then leave a comment below? If you have suggestions, corrections, or questions, I am always happy to respond. Afterwards, feel free to check out some of my other 40k 6th edition articles posted below. Thanks for reading. Murphy Out! What is this things squad points? Aziz, you are so right! Some armies have a much easier time dealing with Armor... and I think Necrons top that list. Eldar and Dark Eldar do a pretty good job, too, because they have access to so many lance weapons...but considering the average Necron warrior can glance even super-heavies to death, I think Necrons have nothing to fear! Great point. You say that it is tough because of the 5+ invun but that really isn't much against most things. For example, I play necrons so the amount of glances I can put on that thing with a warrior phalanx formation (don't remember the name) will make that 5+ save worthless... none-the-less, I see that people would rather have it than not. twiz, it depends on the tournament organizers. With the release of Escalation for 40k, many super-heavies are available for regular games of 40k, now taking up a Lord of War slot in your army composition. These rules are for standard, normal games of 40k. However, if you call Games Workshop's rules hotline, they will tell you that they do not support organized play (tournaments) and that it is up to each club (or tournament) what books or rules they will play with. There are a few major 40k tournaments scheduled to happen over the next few months, and each one of these will certainly publish a list of rules and acceptable supplements (such as the new Escalation). Short answer: you have to check with the tournament organizer if you can bring super-heavies for regular 40k games. I hope this helped! Thanks for reading and commenting. i can use this guy in a 2000 point ternament right? im getting mixed responsess. Haha, that's hilarious. However, you have to make the voice deep and death-metal creepy when you say it . . . "WAAAALLL-EEEEE..."
Oh no its an evil Wall-E. Thanks, guy! We play Fantasy as well, but I've been more on the 40k side. I'm excited about Lizardmen soon! Great article not a 40k player myself but always interested to read about it.